From the top level of a yellow and blue double-decker bus that looked more like an IKEA shuttle than a workhorse of Irish transportation, I watched the congested streets of Dublin slowly fade away, replaced by the open green fields for which the Emerald Isle is rightly famous. 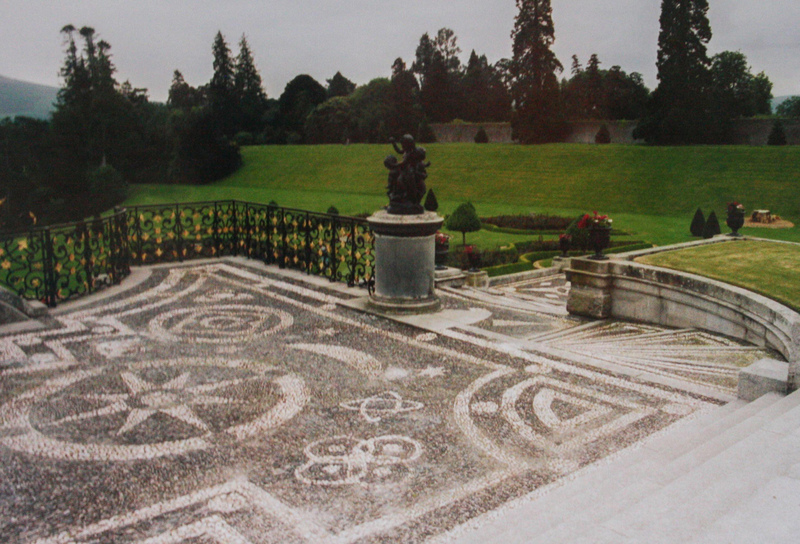 An intricate pebble mosaic on the terrace sets the stage for the estate’s 47-acre garden. Just over an hour later, I stepped off the bus at the main traffic circle of Enniskerry, a highly agreeable little village, and was greeted by a happy golden retriever, probably a stray, although I had an inkling that he was the unofficial town mascot. I was here to visit Powerscourt Estate, originally a 13th-century castle that was transformed into one of the country’s largest mansions in the 1700s. I knew the mansion itself would be off limits due to ongoing renovations, but I was more eager to see its famed grounds, voted the third most beautiful garden in the world by National Geographic. The pleasant walk from town, at just over a mile along a tree-lined path utilized by joggers and strolling mothers pushing prams, became progressively more beautiful, as sweeping vistas of green valleys and the Wicklow Mountains came into view. The Bamberg Gate, originally in a Bavarian cathedral, now graces the grounds at Powerscourt. The scenery was so beguiling that I was caught off guard when I emerged from the trees at the end of the trail and found myself staring at the enormous mansion of Powerscourt. I imagined the interior of this Palladian-style mansion — completed in 1741 with 68 rooms and later expanded — would have been spectacular, but I forgot all about that when I headed around one of the dignified behemoth’s circular domed towers and a sprawling, hilly garden presented itself. My eyes swept over some of the 47 acres of gardens ahead of me, past the black-and-white pebble mosaic floors on the mansion’s terrace, down the tremendous staircase cutting through impossibly green lawns dotted with statues, to the fountain in the middle of Triton Lake, to the conifers and Sugarloaf Mountain beyond. As I descended the stairs, I imagined what it would have been like to have been one of the obviously very privileged children to have lived here, with this seemingly boundless playground right outside their doorstep — a herculean project that took 20 years to complete, in 1880. The whimsical Pepperpot Tower keeps guard over the verdant valley. The Italian Garden around me introduced me to the scale and scope of this massive undertaking. More than 100 workers labored for over 12 years to achieve the very formal landscaping of the terraces leading to the lake. Perfectly trimmed hedges, classical statues atop pedestals, and giant urns filled with flowers flanked the broad staircases and landings to the lake. At the bottom, two zinc winged horses, rearing up on their hind legs, watched over the lake. Just off shore, water shot straight up, geyser-like, from a fountain styled after a fountain in a Roman piazza, returning to the lake as a spray that settled on the surrounding water lilies. 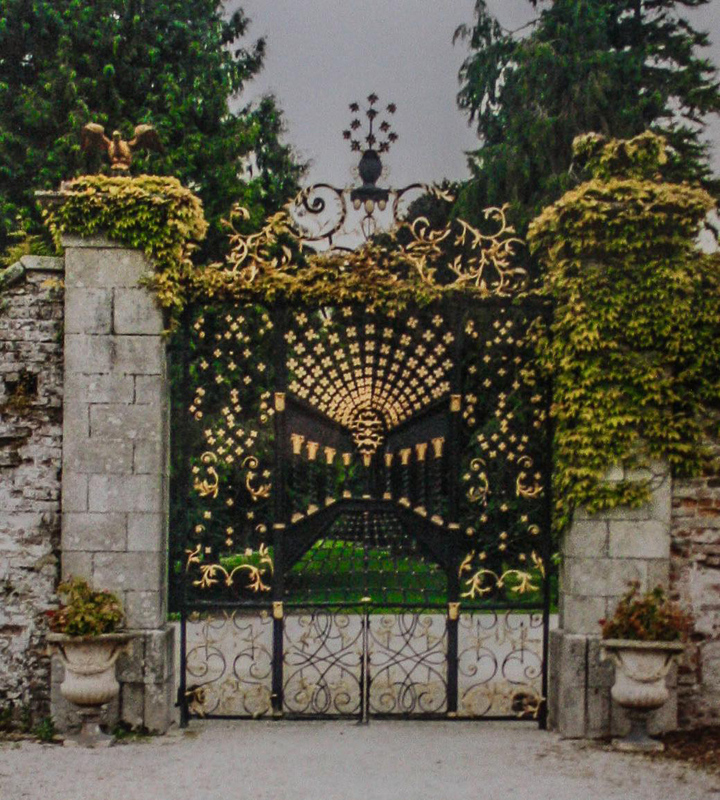 From here, each of the garden’s highlights gradually revealed itself in the most enchanting manner, often by passing through an ornate gate separating one section from the next. The 240-year-old Bamberg Gate, originally from a Bavarian cathedral, was particularly striking, with its intricate ironwork and optical illusion that seemed to lengthen the garden beyond it. 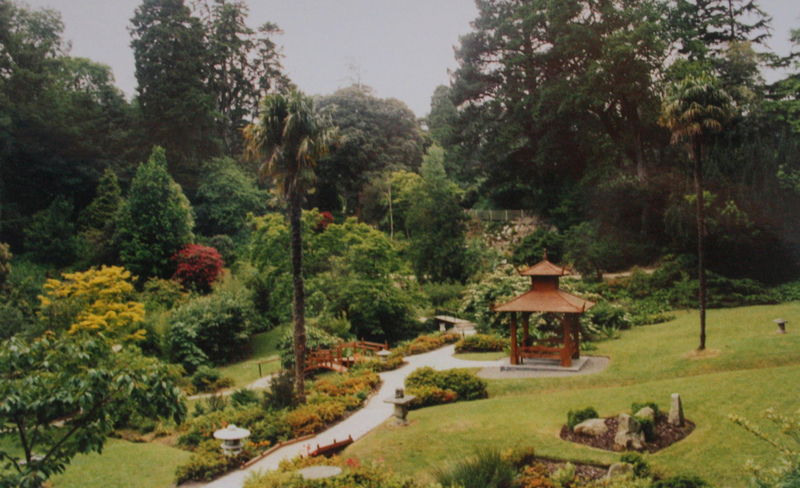 The Japanese Garden, one of Powerscourt’s most tranquil spots. Entering the bosky Tower Valley, I was so captivated by the different shades of green in the trees and the red, blue, and purple flowers that I practically missed the valley’s key attraction, the fantastical Pepperpot Tower, an impractical, whimsical feature added to the grounds in 1911. 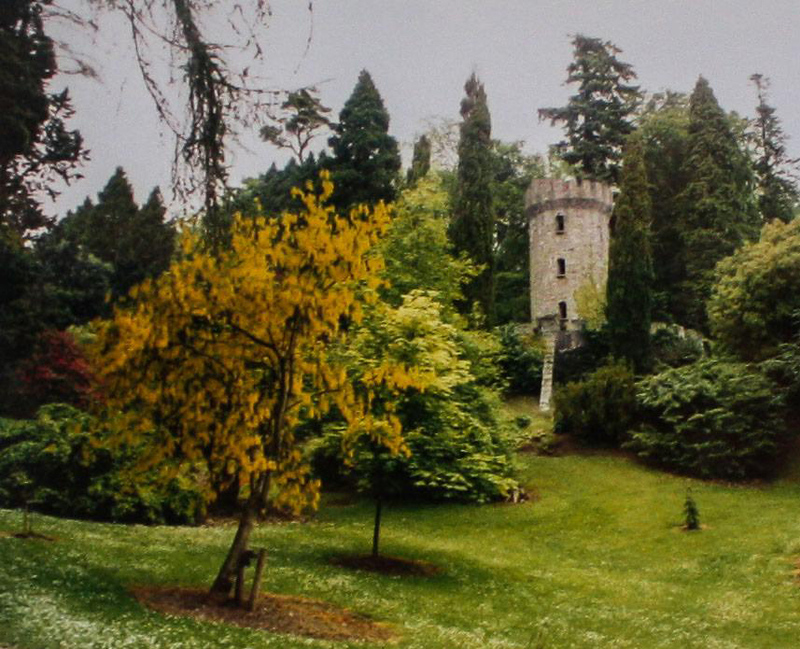 Fashioned after a pepper pot from the dining table in the mansion, the tower was built using stones from a church on the property that was demolished when a new church was constructed in the village of Enniskerry itself. From the top, in between the cannons jutting out of the crenellations, I appreciated marvelous views of the grounds and the abundant trees, including Sitka spruce, Torrey pine, dawn redwood, giant sequoia, Western red cedar, European silver fir trees, and the tallest tree in Ireland, a 202-foot Douglas fir — taller than Niagara Falls. As I emerged from the valley, I looked down at the Japanese Garden that was laid out in 1908. The irresistible tranquility of the garden washed over me as stone lanterns led me along winding paths to the pagoda, the trickling streams and gentle waterfalls, and the wooden bridges. Just outside this garden’s borders, I entered a grotto, a leftover feature from the original garden from the 1740s. With its meandering pathways and water features, the grotto, made from a fossilized moss, reflected the unmistakable romanticism of an earlier era. 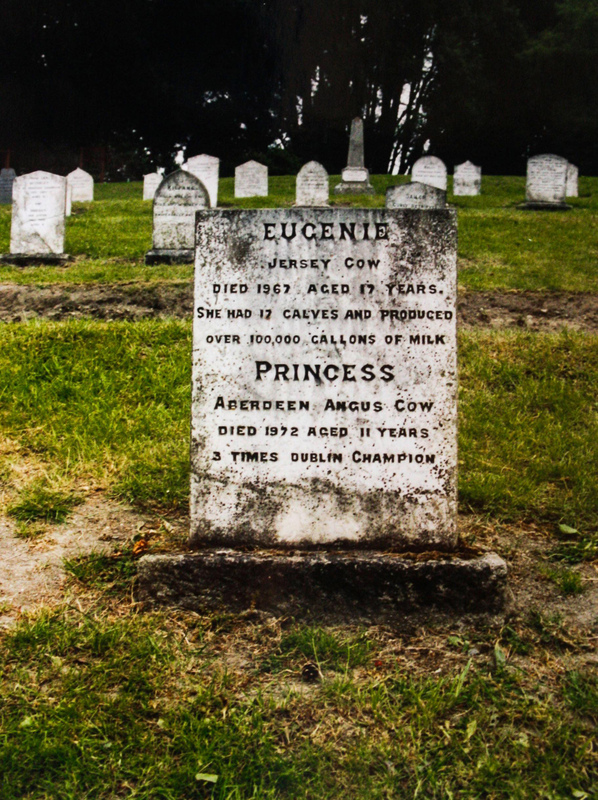 Mourning the loss of a beloved, and apparently very productive, Jersey cow. Given the sheer size of the gardens and their immaculate condition, I was more than surprised to learn that only six full-time gardeners, aided by a couple of horticulture students during the summer, oversee the plantings, maintenance, upkeep, and repairs. What can be said about such a small staff for such a prodigious responsibility? Job very well done!